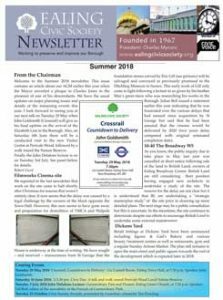 Our summer Newsletter is now out. Read the latest about the Filmworks cinema site, 10-40 The Broadway, Dickens Yard and Pitzhanger Manor. There is also news about our recent events and our comments on new planning applications. Many of our members came along to the recent talk about Charles Jones and the unveiling of our latest plaque which commemorates Charles Jones. Paul Fitzmaurice has written a piece for the Newsletter on one of Jones’s sons, Frederick Hall Jones, also an architect, who designed buildings in central Ealing including the “Edwards” parade in the Mall. All members will have been sent the Newsletter if they have consented to receive communications from us. Download our summer Newsletter by clicking here. Back issues may be found on our Newsletter page.